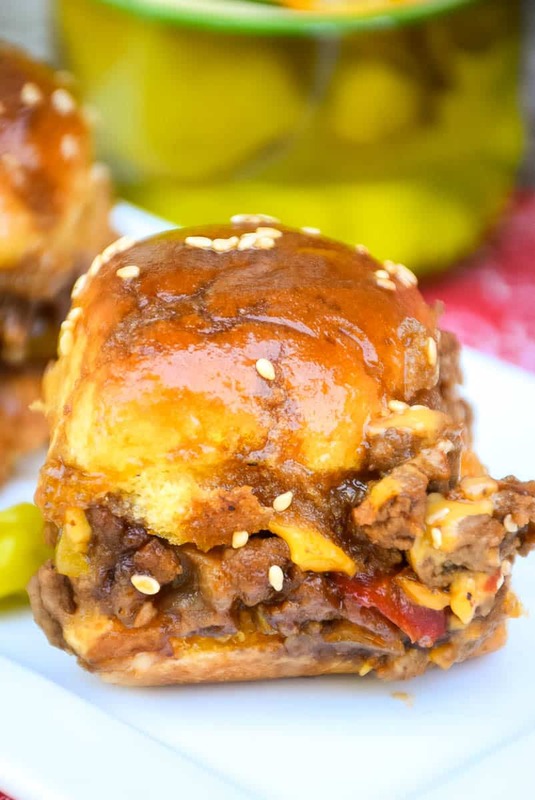 Peperoncini Barbecue Cheeseburger Sliders are perfectly sized to share at parties and summertime get togethers but are also great for easy family dinners. 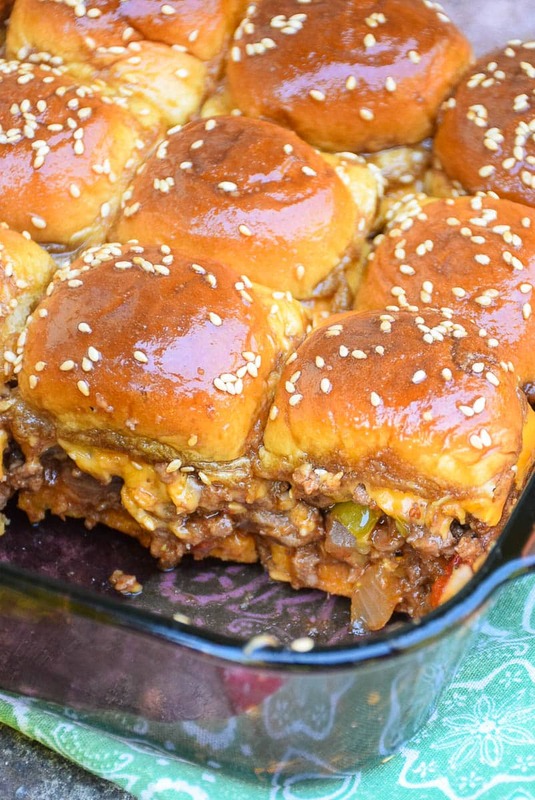 They have that sweet savory butter baked topping that everyone loves on their baked sandwiches as well as the tang and heat of Mezzetta Peperoncini Peppers in the beef mixture! Grumpy and I both crave tangy foods. Peppers to olives, and pickles. If there is a jar around, you can guarantee it isn’t going to take long to hit the bottom of said jar! Grumpy and I love to chow down on the peppers straight from the jar. we also love to buy the slices and put them on subs and pizza. Not to forget we love to eat them in salads and in dips too! 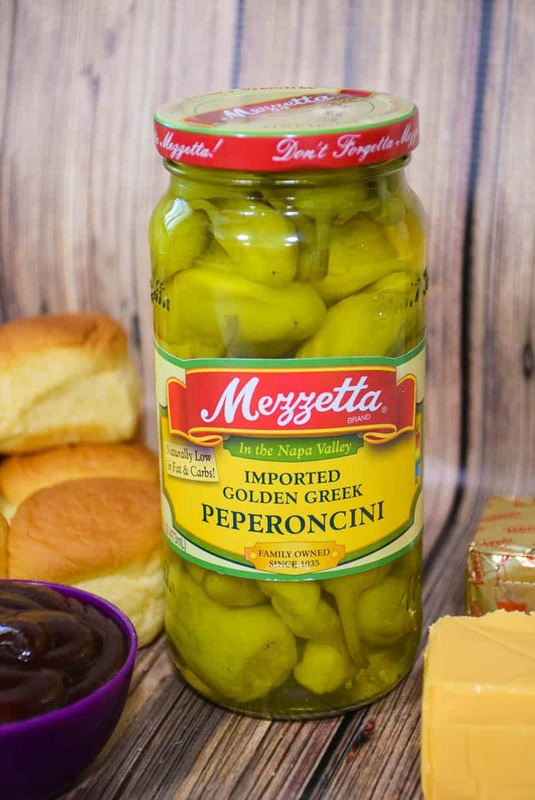 I love taking my everyday recipes to crave worthy with Mezzetta Golden Greek Peperoncini! I decided to make a unique spin on the classic baked slider recipe. We are beef loving people and these peperoncini peppers go so well with beef. Chopping some of the peperoncini and adding them to the barbecue beef mixture was an inevitable. Tell me, what recipe do you have that you can use Mezzetta Peperoncini in to energize and brighten up your everyday? P.S. By the time this post was written, Grumpy had successfully made it to the bottom of the jar! Guess that means I’m on my way to buy more soon! 6 Mezzetta Golden Pepperoncini Pepper, chopped. Over medium heat, saute beef, onions, and red pepper until browned. Stir in Mezzetta Pepperoncini Peppers and barbecue sauce. Remove from heat. Spray 9 X 9 glass baking dish with cooking spray. Slice party rolls in half and lay bottom of rolls in the bottom of your glass baking sheet. Spread the bottom roll layer with the beef mixture. 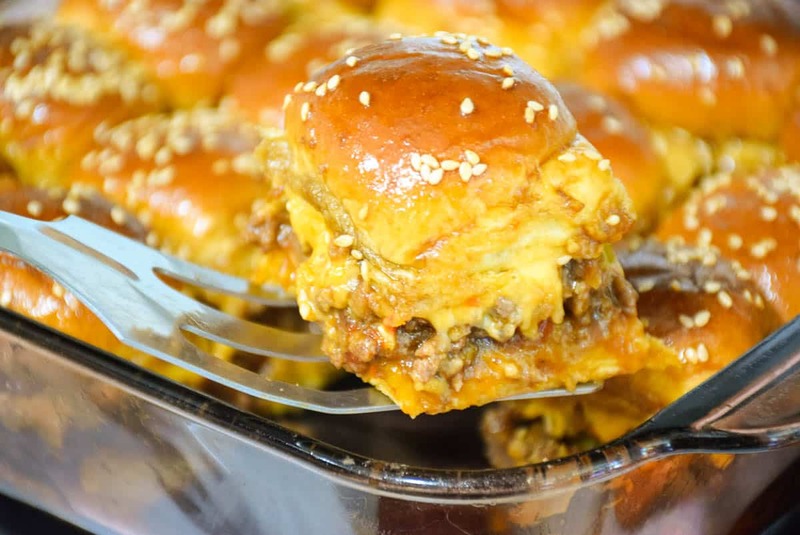 Top with sliced American cheese and then place top of buns over cheese layer. Brush tops of buns with mixture and sprinkle with toasted sesame seeds. Bake in oven for 25 minutes. Serve. These look delicious! I’ll have to make a batch for our football watching crew in a few weeks! This is making me so hungry! Perfect football food!